Kolaches are Czech pastries. They are pieces of bread-like dough filled with preserves or jelly and baked. My mom used to make these a lot while I was growing up. Cream the sugar and shortening together in a large bowl. Beat the eggs and add to the creamed mixture along with the milk, salt, and optional lemon extract. Add the yeast and let stand for 5 minutes. Add the flour and beat in. Knead for a few minutes. The dough will be slightly sticky. Grease cookie sheets and divide the dough into 36 equal pieces. Roll into balls and put on baking pans at least 2 inches apart. Make an indention in the dough. Make it wide and deep. 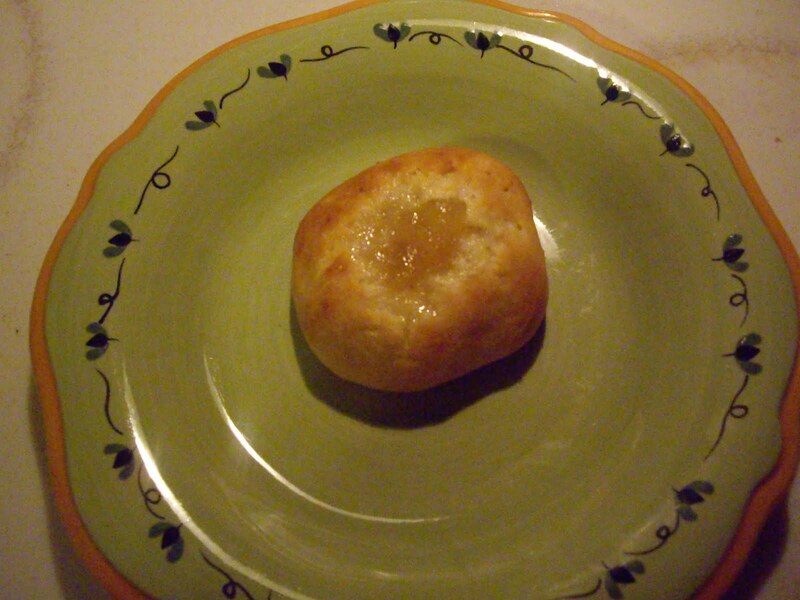 Put about a 1/2 teaspoon preserves in each kolache. Bake for 10-15 minutes or until the kolaches start to turn a golden brown. Use whatever type of preserve you want. In the picture I have used gingered pear jam. This works best to make by hand. Using a stand mixture will cause you to need more flour and the dough will be way too sticky.